When long time Bay of Plenty resident Bernard Sladden died in 1961, his collection of rare books became the property of the Tauranga Historical Society. Because of the value of the books they passed into the care of the Tauranga City Library in 1964. Sladden’s special interests, which are reflected in his collection, were Cook’s exploration of the Pacific, Maori history and natural history. The Sladden library includes early editions of Cook’s voyages, the beautifully illustrated Buller’s Birds and a comprehensive collection of publications by Elsdon Best. Only particularly rare or valuable books are added to this collection. Lewis Coster Sladden (1867-1939). Born in Oxford, Canterbury, in 1867 (reg. 1867/22213). In c1907 he married Frances Mary Cornwall. Lewis died in 1939. George Edward Sladden (1868-1921). Born in Oxford, Canterbury, in 1868. He died in 1921. Francis Dilnot Sladden (1870-1939). Born in Oxford, Canterbury, in 1870. He died in 1939. Arthur Julius Sladden (1872-1940). Born in Oxford, Canterbury, on 27 August 1872. Arthur died 12 May 1940 and was buried in Tauranga Anglican Cemetery. Percival John Sladden (1874-1947). Born in Oxford, Canterbury, in 1874 (reg. 1874/36868). He married Mary Bourchier Bristow. Percival died in 1947. Mabel Bessie Sladden (1876-1952). Born in Oxford, Canterbury, on 10 May 1876 (reg. 1876/2799). She died in 1952. Mary Agnes Sladden (1878-1967). Born in Oxford, Canterbury, in 1878. She died in 1967. Bernard Sladden (1879-1961). Born in Oxford, North Canterbury, on 28 October 1879 (reg. 1879/17480). Died in Tauranga on 25 May 1961. Hubert Sladden (1880-1952). Born in Oxford, Canterbury, in 1880 (reg. 1880/18635). In 1907 he married Melita Meredith. Hubert died in 1952. Edmund Maurilyan Sladden (1882-1962). Born in Oxford, Canterbury, in 1882 (reg. 1882/11584). He died in 1962. Violet Susanna Coleman Sladden (1884-1955). Born in Oxford, Canterbury, on 7 May 1884 (reg. 1884/20115). She died in 1955. 1926: Issued a warrant to take two Tuatara from the Alderman and Mercury Groups, for the purpose of study (signed by the Minister of Internal Affairs, Richard Francis Bollard. 1952: Historical Societies revived under the name Whakatane and District Historical Society. Bernard served with the New Zealand Expeditionary Force during World War I. His occupation at the time of signing up was Sheep Farmer. He was gassed whilst serving in France and admitted to hospital in June and July of 1917. He was finally discharged on 28 May 1918 as 'no longer physically fit for war service' on account of gas poisoning. In the 1920s Bernard moved to the Bay of Plenty where he would spend the rest of his life. He became a notable wildlife ranger, historian and naturalist. His interest in the Bay of Plenty's maritime history would see him make corrections and clarifications to maps of the area. 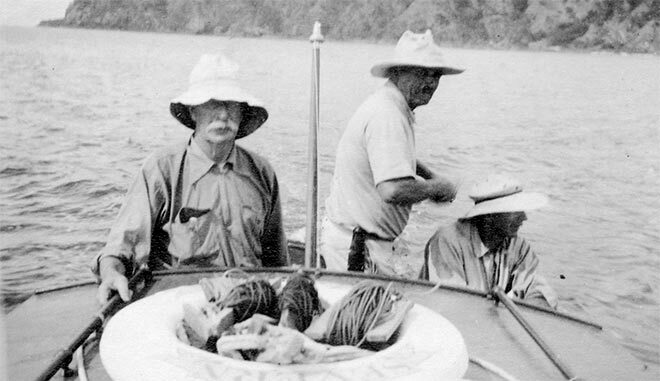 In the years following his move to Tauranga, he became honorary ranger of the off-shore islands in the Bay of Plenty. He was also a member of the local historical societies and published several important papers. After his father, Dilnot, died in 1906, Bernard inherited his father's personal library. Bernard added substantially to this collection in line with his personal interests, one of which was the life and works of Captain James Cook. Bernard Sladden (left), and two friends, onboard his launch Severn (c1940). 1937: White Island, or Whakaari. Its history, physical features, bird and plant life. 1960: A Waka-kereru from the Waimana district. Bernard did not marry or have children. He died in Tauranga, aged 81, on 25 May 1961, and was buried in the Tauranga Anglican Cemetery in the same plot as his brother, Arthur Julius Sladden. After Bernards death his collection of around 600 items was housed in the old Council Chamber along with the old horse-shoe council table. In 1964 the books passed into the care of the Tauranga City Library. Additions were received to the collection such as those by living relatives of James Wedderspoon and books won as language prizes by Katikati founder George Vesey Stewart. Today the Bernard Sladden Research Library is held in a fireproof room in Research Collections at Tauranga City Library. A Scholarly Historian - Bernard Sladden by William E. Morris (Historical Review, November 1977, 60: 2-6). A short account of the Sladden Library (1971) by L.W. Melvin. Bernard Sladden by Jinty Rorke (Te Ara - the Encyclopedia of New Zealand). Births, Deaths & Marriages Online (New Zealand). Military Personnel File (Archives New Zealand). The Late Bernard Sladden by L. W. Melvin (Journal of the Tauranga Historical Society, March-August 1961, 15:3-6). The Story of the Bernard Sladden Library by W. W. Morris (Historical Review, May 1978, 61: 2-5).